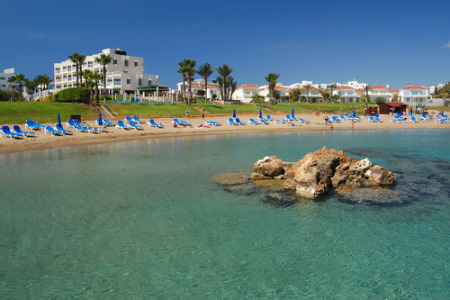 Protaris holidays take you to a purpose built resort on the east coast of Cyprus. This jewel of the Mediterranean lies south of Turkey and is a fascinating island with stunning beaches and archaeological remains. Holidays to Protaris can be taken from April until October with temperatures rising from mid-twenties to mid-thirties at the height of the season. With seven miles of sandy beaches it is no surprise that our cheap Protaris holidays are snapped up by families. Those with young children can relax, knowing that the shallow waters are ideal for paddlers and non-swimmers. Holidays in Protaris have wide appeal as the resort has much to offer. Water sports enthusiasts have a choice of activities. The waters in the many rocky inlets are crystal clear and hold abundant marine life making them ideal for snorkelling and diving. Golfers have a choice of courses and there is a range of other land based activities as well as many sightseeing opportunities. With good accommodation and numerous restaurants catering for every taste, our low cost Protaris holidays offer great value for money. Although there is no dusk to dawn partying, Protaris nightlife is nevertheless fairly vibrant with music bars and discos pumping out music. Protaris may not be the most attractive of resorts, but it certainly offers a warm welcome to visitors. If you a looking for a guarantee of summer sun in a resort with good amenities, our Protaris holiday offers may be just the ticket. For further information, and to view our best Protaris holiday deals, please use the search facility.